Doles Orchard Box Shop - offering a wide variety of wood working and laser engraved products and services. 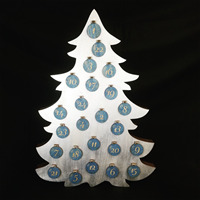 Count down to Christmas with our Made in the USA Wooden Advent Calendars. 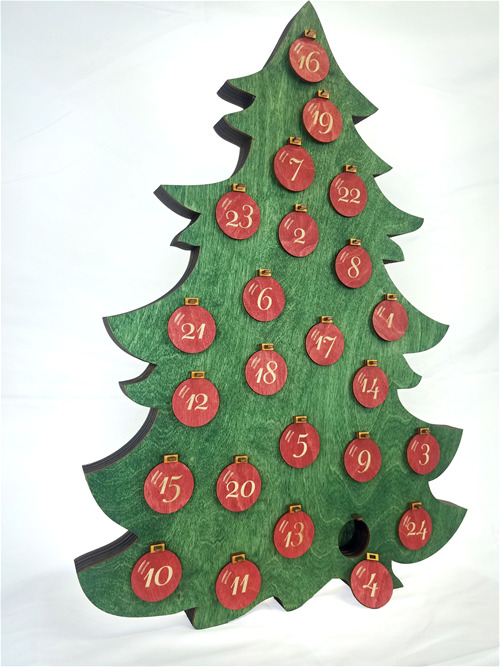 Using colorful wood stain and paint, the calendar has large enough holes to be filled with unique treats and surprises making for a beautiful holiday tradition that will delight your family throughout the years. 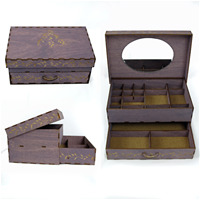 It is decorated with traditional looking ornaments with laser engraved numbers. Advent Calendars are sold empty, and do not contain any gifts. Please fill with special gifts of your own! 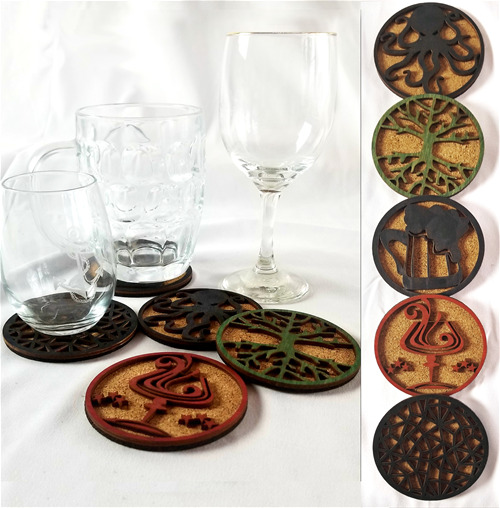 Protect your fine wood surfaces with a set of these unique laser cut, cork backed coasters - perfect for the bar top of coffee table! 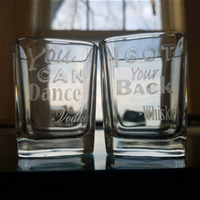 Choose from a variety of original designs and colors. 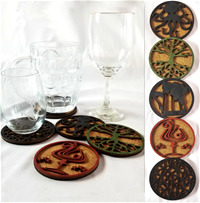 Non-skid cork protects your table while enjoying the laser-cut designs of these one of a kind coasters. 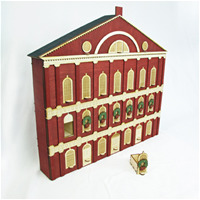 Count down to Christmas with our Made in the USA Wooden Advent Calendars. Using colorful wood, stain and paint, the calendar has large enough drawers to be filled with unique treats and surprises making for a beautiful holiday tradition that will delight your family throughout the years. 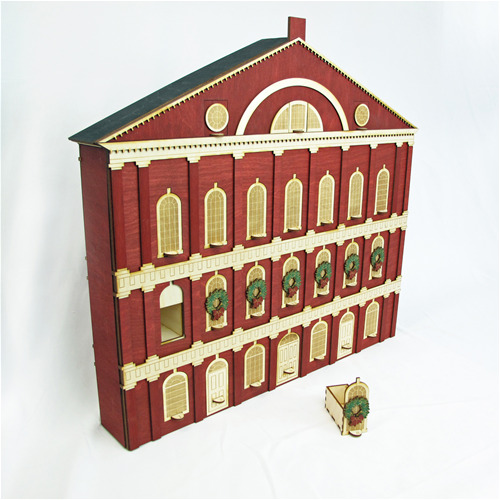 Our Historic Architecture Advent Calendar is actually a replica of the historic Faneuil Hall in Boston’s Marketplace. Measuring approximately 25”W x 23”H x 4”D, this beautiful calendar includes many fine architectural details, and festive Christmas wreaths. Measuring approximately 25”W x 23”H x 4”D, this beautiful calendar includes many fine architectural details, and festive Christmas wreaths. Each drawer measures 1.4"W x 1.8"H x 2.8"D inside. Created from our own designs, this building contains over 200 pieces, cut with laser precision, and then assembled and decorated by hand at our small shop in Southern Maine. The striking look and outstanding craftsmanship of our etched shot glass gift set is the perfect addition to any home bar. 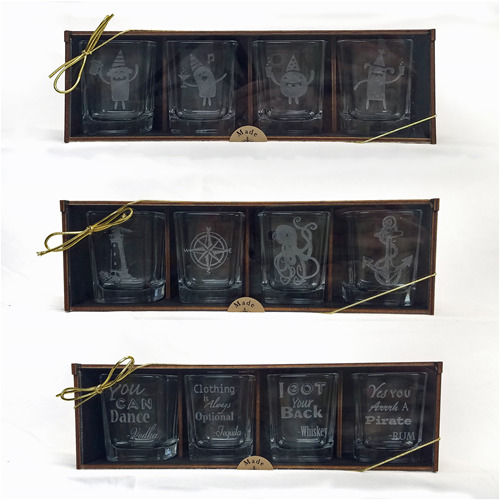 Four engraved, heavy bottomed, shot glasses are pair with a custom, handmade display box with 3 classic and fun designs to choose from. 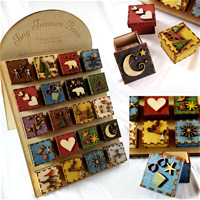 A collection of adorable keepsakes boxes to hold only the sweetest of treasures. In appreciation for the small things in life, these Tiny Treasure Boxes come in a variety of colors and designs – find just the right box for someone special in your life and watch the smiles appear! Every box is made of 100% recycled materials; we upcycle all of our scraps and use remnants from our luminary designs for adornment.